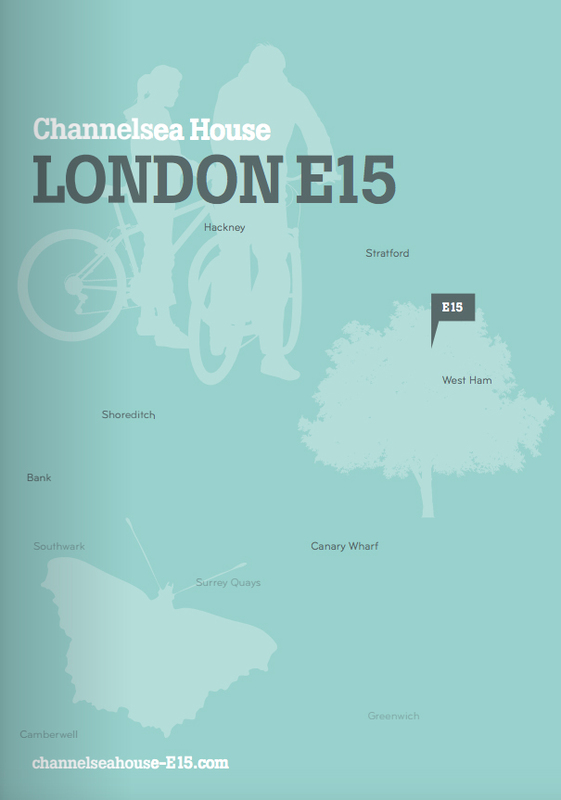 Channelsea House is a development of 72, one and two-bed, newly converted apartments located in Stratford. A superb renovation featuring a new facade and landscaped garden with secure underground car parking. Externally, this East-London renovation has been given a contemporary, urban finish. In contrast, the sleek interiors offer open plan layouts with bright, spacious and modern living accommodation. A desirable open plan layout comprises the kitchen, dining and living space, offering a multi-purpose family and entertaining space. The interiors are fresh and modern, with both sleek and functional design details. A neutral palette provides a simple backdrop for your personal touches. Contemporary kitchens are completed with a range of integrated Bosch appliances, while bathrooms are fitted with cast iron baths, rain showers and heated towel rails. Based in the heart of Stratford, this location is truly thriving. 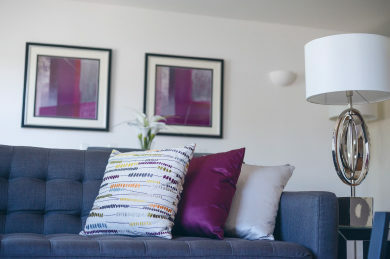 Since the initial investment towards the 2012 Olympic Games, it has continued to see regeneration projects flourish, making these ideal properties for both first time buyers and investors. Westfield Stratford City is the largest urban shopping and leisure destination in Europe, with over 250 shops, 65 restaurants a 17-screen cinema, bowling alley and 24 hour Casino. 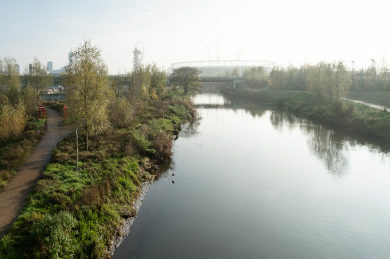 The River Lea is a popular and picturesque place to enjoy a walk, a picnic or as a route to explore the rest of the historic or sporting attractions Lee Valley has to offer. Try Three Mills Island for the oldest and largest tidal mill in the country or the Lea Valley White Water Centre for white-knuckle rafting. The smaller Channelsea River, located just beyond the apartments is one of the smaller Bow Back Rivers that flows into the River Lea. Legend claims that this was a result of Alfred the Great blocking the River Lea in an attempt to outwit the Danes, who were invading Britain at the time. 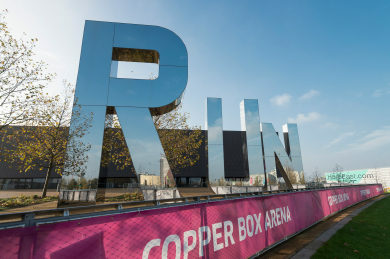 The Olympic legacy know as the Queen Elizabeth Olympic Park, boasts a range of now iconic sporting facilities, such as the Aquatic Centre, the VeloPark and the Copper Box Arena. The expanse of green space and parks can be viewed from Anish Kapoors ArcelorMittal Orbit, the UK’s tallest sculpture. Nearby Victoria Park offers a sanctuary from the bustle of City life with great open parkland, some superb gastro pubs and a selection of independent stores. Its creative residents have a village spirit, making it a popular destination to visit and enjoy. The commute to the City, Liverpool Street Station, is around a 20 minute journey. Onward destinations of interest from here include Shoreditch, Hoxton and Spitalfields; all of which offer a diverse array of shops, bars, restaurants and galleries. Or why not visit Brick Lane; a favoured spot, buzzing with art, music and quirky shops, not to mention its infamous Bagel bars and Curry houses. The impressive Canary Wharf towers are not simply home to London financial district. Its bars, restaurants and shops are now established as a destination of their own. The ExCel Exhibition Centre hosts an annual programme of indoor events to suit every hobby and interest, while the 02 Arena has established itself as one of the worlds most iconic stages for music and entertainment. Abbey Road Station is the local DLR station which runs frequent services to Stratford, Canary Wharf and Bank. West Ham is the closest underground station and is served by National Rail, London Underground (District, Hammersmith and City and Jubilee lines) and the Docklands Light Railway (DLR). Liverpool Street is an 11 minutes journey and Bond Street takes 22 minutes. 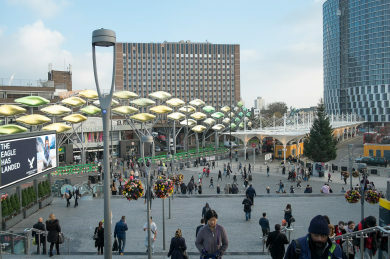 Stratford station is served by the DLR, Jubilee and Central Line Tube, and National Rail services operated by Greater Anglia, while Stratford International is served by the DLR and Southeastern High Speed services. Stansted in the closest International Airport, however all three major London Airports, including Gatwick and Heathrow can be reached within an hour. London City Airport can be reached with 10 minutes via the DLR (London City Airport Station). Buses that run to Stratford bus station and Stratford City include, but not limited to the 25 from Oxford Street to Ilford; 108 from Lewisham to Stratford; 238 from Barking; 276 from Stoke Newington to Newham University Hospital; 308 from Clapton to Wanstead; N8 from Oxford Street to Hainault (night bus). Stratford Greenway is adjacent to the development, part of the National Cycle Network and is suitable for cyclists, walkers and wheelchair users. Barclays Cycle Superhighways are designed to offer safer, faster and more direct journeys into the city. The CS2 runs from Stratford to Aldgate.